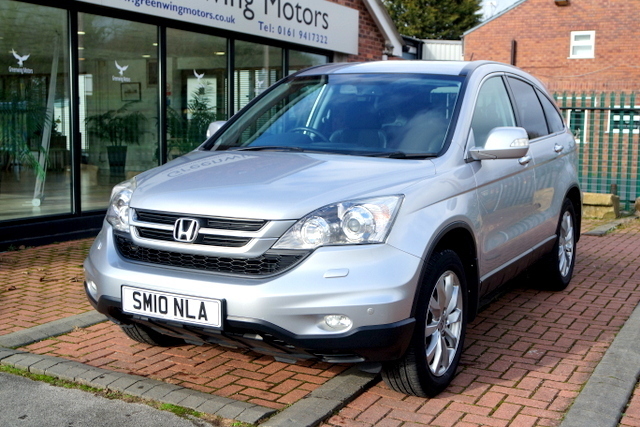 2010 Honda CR-V ES 2.2 I-DTEC Auto 4WD. 74,000 miles with excellent service history. Total 8 service stamps. MOT till Feb 2020. Experian Auto check. Last owner since 2016. Stunning condition inside and out. Spec includes: half leather / suede seats; heated seats; cruise control; front & rear parking sensors; rear privacy glass; auto rear dipping mirror; HiD headlamps with washers; CD / Radio / AUX / USB; steering controls; removeable towbar; power fold mirrors; electric windows; dual zone digital climate control; spare wheel; remote central locking; 18" alloy wheels. We offer low rate finance packages with no deposit option available. Price includes 6 months AA warranty package and 12 months AA breakdown cover. Part exchange low mileage vehicles considered, Viewing highly recommended. Please note we do charge an administration fee of £50.00 plus VAT on all vehicle purchase. To arrange early viewing and test drive, Please contact our sales team on 0161 9417322. We are close to M6 Junction 19 and M56 Junction 6. (Postcode WA15 0QW).